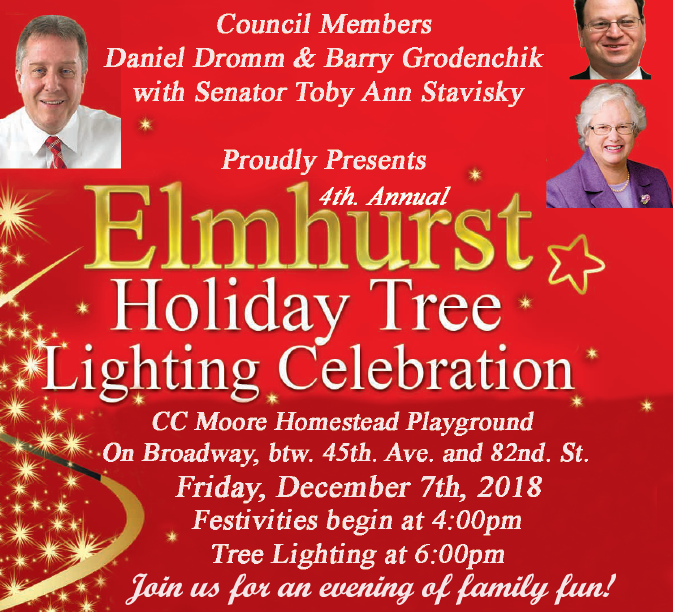 Council Member Daniel Dromm, Council Member Barry Grodenchik and Senator Toby Ann Stavisky invite you to the 4th annual holiday tree lighting celebration at CC Moore Homestead Playground. 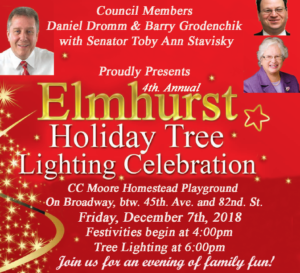 Festivities begin at 4 pm and tree lighting takes place at 6 pm. This event includes holiday-themed children’s activities, free refreshments, caroling with local schools, and the Christmas tree lighting. With generous support from Corona Plaza Business Alliance, Queens Economic Development Corporation, Queens High School for Language Studies, Elmhurst Supporters of Parks, The Newtown Civic Association, Elmhurst History and Cemeteries Preservation Society, Inc., Corona Ambulance EMS, Perna Foundation for Kids, and Queens Community Board 4.